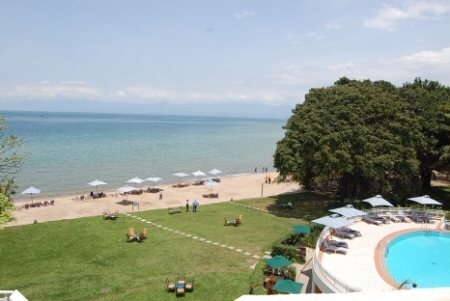 Lake Kivu is located on the border of Rwanda and the Democratic Republic Congo. It is 89 kilometers in length and 48 kilometers wide, covering a surface area of 2,700 sq km squared at an average depth of 240m with maximum depth at 480 meters, water volume of 500 km³ and surface elevation of 1,460 meters. The islands found on this lake are: Idjwi and Goma Bukavu (in Congo) yet the settlement areas are: Kibuy and Cyangugu (in Rwanda). 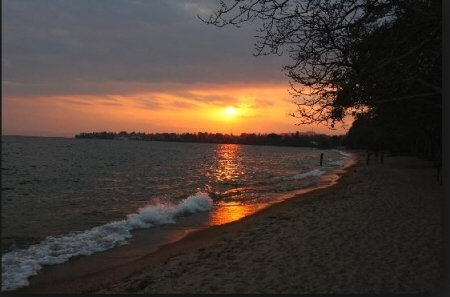 Lake Kivu is among the main lakes in Africa and it found on the border of Rwanda and Congo, within the Albertine western Rift, and part of the Great Rift Valley. this lake pours into River Ruzizi and flows southward to Lake Tanganyika. This lake covers an expanse of 2,700 sq km and a height of 1460 meters above sea level. The bottom of the lake rests on the rift valley floor which is actually pulling apart resulting into volcanic action within area therefore making it very deep at 480 meters and it is ranked as the 15th deepest lake in the world. Lake Kivu is delimited by beautiful mountains. The 10th largest island in the world is found in Lake Kivu and some of the villages around this lake are: Sake, Kalehe, Kabare, Bukavu, and Goma found in Congo plus Cyangugu, Gisenyi and Kibuye in Rwanda. Among the Fish species caught here are: Haplochromis, Clarias plus Barbus, and the Nile Tilapia which was later introduced in the lake together with the Tanganyika Sardine. Lake Kivu is one the 3 (Lake Nyos in Cameroon, and Lake Monoun) recognized exploding lakes, that experience vicious lake overturns. Investigative views of the geological history reveal a repetitive huge biological extinction close to every one thousand years in this lake. The cause of the lake overturns, are actually not well known, however sporadic eruptive action is expected. The gas chemical constitution of the exploding lakes is unique to each lake; particularly Lake Kivu methane and carbon dioxide as a result of lake water mixing with a volcano. The danger of Lake Kivu experiencing a turnover would extremely be very disastrous since approximately two million people live within the lake basin. Scientists think that enough volcanic interaction with the water bed of the lake bears high-pressure gas concentrations might heat water, compelling the methane away from the water, resulting into a methane explosion, together with triggering virtually simultaneous escape of carbon dioxide. This carbonic-acid gas would eventually suffocate large numbers of people on the lake basin whilst the gases escape off the surface of the lake. It is still considered that this lake may create lake tsunamis as the gas blows from it. Methane from Lake Kivu was primarily considered to be a cheap natural resource for export and generation of inexpensive energy. When this chemical mechanism that resulted into lake overturns began to be known of, also the consequent threat of this lake action to the neighboring communities. An experimental vent-pipe in 2001 was placed in Lake Nyos to de-gas the lake’s deep water, nonetheless this measure on the large Lake Kivu would be very expensive. Actually there aren’t any plans that have been put in laces to reduce this great threat on the lake. recently, Lake Kivu was discovered to contain about 55 billion c.c of methane gas in a liquid form at a depth of 1000 feet or 300 meters. until 2004, the extraction of this gas was done on small scale, and distilled gas used for run boilers at the Bralirwa brewery, the located in Gisenyi. the government of Rwanda is in negotiations with a couple of parties to as much as large scale exploitation of the resource, to generate methane from this lake. the Extraction is considered to be affordable and easy because when the water rich in gas is pumped upwards all the dissolved gases (initially methane, carbon dioxide and hydrogen sulphide) begins to bubble out as the force of the water reduces. This projection is anticipated to increase the power generation capacity in Rwanda by up to 20 times and perhaps will enable the country to sell power to its neighboring countries. The very first European – German Count Adolf von Gotzen to visit this lake was in 1894. For then it has been mixed up in the contradiction between the Tutsi and the Hutu people in Rwanda, together with their associates in Congo, which resulted in the Rwandan Genocide back in 1994 as and the first plus second Congo wars. Actually several dead bodies were seen floating on Lake Kivu after the genocide.